Some say the new Shanghai Oriental Arts Center looks like a butterfly. I say it should have spent some more time in its cocoon. Designed by French architect Paul Andrea — who also designed the opera house currently under construction in Beijing — the hall is variously described as resembling a butterfly and an orchid, with five segments containing the main entrance, the concert hall, a 1,020-seat opera house, a 333-seat auditorium, and an exhibition space. At night, lights on the roof will change color in coordination with the music inside. I attended a show inside the butterfly last night, just two days after the $120 million dollar Shanghai Oriental Arts Center opened its very expensive doors. The concert — performed by the Berlin RIAS Broadcasting Philharmonic Orchestra — was billed “The Night of Dynamic Crystal.” And that billing makes absolutely no sense unless you know that the evening was sponsorerd by a real estate development firm that, for some reason, named itself Dynamic Crystal. I was given two free tickets to the concert because of some relatively shady “work” I did for Dynamic Crystal a couple weeks ago. So please, follow me as I take you on a walking tour though the latest impersonal monstrosity to go up east of the Huangpu. The photo essay begins here. 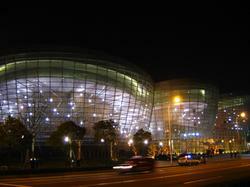 here is my idea, change the classical music art center to Shanghai Rock’n’roll Art Center. Looks like they were channeling Singapore’s Esplanade, the durians. That building looks brillian inside. But it’s yellow cell-like elements look biologically disgusting when seen from the outside at night with lights on. You really think the inside looks “brilliant”? Where are you from? China? Because I think we Americans got stuff like this out of our systems in the 60s, 70s and 80s. Thus, as with most other matters of style in China, it makes sense that a building like this would be rather popular for the Shanghainese in 2005. Tell me what you think about it five years from now. Or five months. Actually the interior design of the concert hall kinda reminds me of “Alien”, dunno why. But let’s face it this is just one of the efforts made by the local government to catch up with, errrrrrr, “international standards”, or whatever you coin it, shall we?